at a beautiful, eco-friendly hotel within walking distance to galleries, restaurants and shops of historic downtown Jackson. Traditional guest rooms offer your choice of a king bed or two queen beds with triple sheet bedding, western themed interior, microwave, mini-fridge, oven, coffeemaker, cable TV with HBO, hairdryer, iron, ironing board, and more. In addition to western hospitality and modern luxuries, your hotel provides complimentary airport pickup, free wi-fi, on site laundry, hot continental breakfast, indoor swimming pool and hot tub. at the eastern gateway to Yellowstone in a small western town with a friendly attitude, named after Colonel William F. “Buffalo Bill” Cody. Here, you will stay in a modern log cabin, with a king sized bed, flat screen TV, micro/fridge, coffee maker, hair dryer, wi-fi, western motifs, outdoor porch with chairs and more. The property is the number one rated hotel in Cody, and features an extra large heated outdoor spa and complimentary continental breakfast. in the Grand Teton National Park surrounded by pine trees and the majestic beauty of the Grand Teton Mountain Range. Check in to a Patio Cottage located in single-story clusters just outside the main building, featuring a private entrance with two queen beds and a full bath. 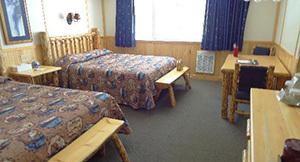 Your accommodations here offer a patio overlooking a forest setting, complete with two outdoor wooden chairs. 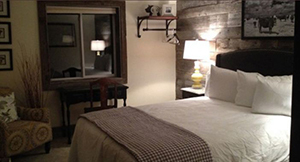 Each room has a private entrance with a single king bed and a private bath. *Please note, rooms do not have televisions or radios, but do have telephones, voice mail and data ports. * Facilities include: gift and apparel shops, heated outdoor pool, a service station and a medical clinic. 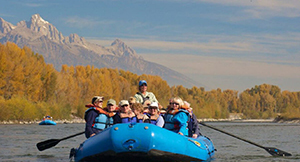 Cruise through the beautiful Snake River Valley in a comfortable guided raft, with the snow-capped Teton Mt Range as your backdrop. Your 13-Mile journey offers plenty of wildlife viewing and some of the best eagle-nesting habitat in the country. Be sure to bring a camera, as you might also see deer, otters, an occasional moose or elk, eagles, kingfishers, and osprey. Your friendly, knowledgeable guide will provide binoculars and a deli style lunch on the raft. Round trip is approx. 3 hours. Enjoy a 60-minute, 22-mile tour with two live narrators, historical photos, pass-around relics and entertaining audio clips, to share the story of world-famous William F. “Buffalo Bill” Cody. From the cozy oak interior of a festive trolley, visit and learn about Cody’s historical sites, scenic vistas, geology, wildlife and old and new west attractions. The best and fastest way to gain an overview of all that Cody has to offer and a delight for the entire family. Learn 100 years of history in one hour! Boasting five internationally-acclaimed museums under one roof! The interactive museum of natural history is always a hit with the kids and all ages will enjoy learning about the amazing life of “Buffalo” Bill Cody. You will also learn the stories of the Plains Indians, see the west through the eyes of various artists and discover the role of firearms in Western History. Your trip to Wyoming isn’t complete without a visit to one of the most complete museums of western history in the country. This trip takes you to the Northern Range, including Lamar Valley, which provides the perfect habitat for bears, wolves, elk bison, pronghorn and bighorn sheep. If the wildlife is around, the combination of early evening hours and a Historic Yellow Bus creates a perfect opportunity for wildlife watching. Bring your camera, binoculars, water and snacks if necessary. This excursion may include some walking. Approximately 3 hours round trip. All ages. 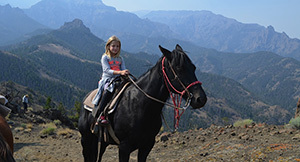 No trip to the Old West is complete without a horseback ride through Grand Teton National Park. Seeing the magnificent Teton views from horseback, the same way the early explorers traveled, will create a lasting connection between you and the Grand Teton landscape. Your two-hour ride heads north, crosses the willows, and then climbs to the high ground east of Christian Pond before reaching Emma Matilda Lake. On the return trip, you pass the Oxbow Bend Overlook. Ages 8 and above only. Yellowstone Lake is the largest freshwater lake above 7,000 feet in North America and is home to native Cutthroat Trout and the exotic Lake Trout. Your fishing trip leaves from the Bridge Bay Marina in a 22' Grady White and includes an experienced fishing and/or tour guide, fishing gear (rods and tackle), life jackets for each person, gas, and fish cleaning upon request. While on the water, passengers are not only fishing, but also treated to history of the area, while watching for eagles, ospreys, and such shoreline wanderers as waterfowl, and occasional elk and bison. Maximum of 6 passengers. *Please note the cost of entrance is not included in the package price.